9 preset programs (JustGo, Manual, Walk, HillClimb, Track, Cardio, Weight Loss, Speed Run, Heart Rate Control, Walk) 2 Learn, 2 User defined. Apart from this the Bodyguard T240 treadmill is customizable in 3 languages (Spanish, French and English). The warranty on the Bodyguard T240 treadmill is excellent. It gives a lifetime cover on frame and motor; 10 years on parts and electronic parts and 3 years on labor – almost unparalleled. The deck is beautifully cushioned by a very effective BDS cushioning system that does not cause excessive rebound when you run. There is also the Advanced Friction Detection System which prevents the overheating of motor by a continuous checking of the friction between the deck and the belt. Lastly, it is equipped with an electronic Stride Control mechanism that prevents fluctuations of speed for heavier weigh users. For a residential treadmill and to some extent even for a commercial grade treadmill, this is a near perfect in the market as of now. Priced at USD 2499, it is also available at USD 2099 from certain suppliers, so do your homework. The only thing I could point to was the need for a slightly longer running area – something like 57”, but 54” will be comfortable for most users. 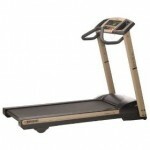 Buy a Bodyguard T240 Treadmill from Amazon.com. Buy a Bodyguard T240 Treadmill at eBay.com. 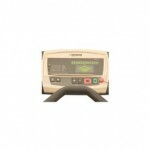 Compare prices of the Bodyguard T240 Treadmill from various retailers using Bizrate.com.